Camp Hill Kindergarten believes that play is the context for learning through which children organise and make sense of their world as they actively engage with people and a dynamic environment. 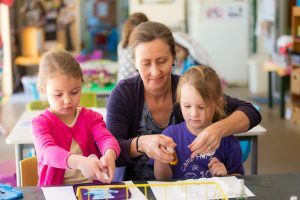 Our teaching staff visualises an early childhood education that celebrates individual children’s strengths as they discover and learn through play. Consequently, our staff believes in an emergent curriculum, collaboratively developed with the children as they explore areas of interest to them, supported by intentional teaching that extends their growing knowledge. We value the experiences, ideas and knowledge that children bring to the program from their familial and cultural backgrounds – consequently, we strive to develop collaborative relationships with families and communities honouring and respecting their diversity in gender identity, religious practice and heritage. We value and respect Australia’s First People and we acknowledge their custodianship of the land on which we work and play. Camp Hill Kindergarten is committed to embedding knowledge and respect for our First People’s cultural perspectives to those who belong to our kindergarten community. We provide a safe, caring, engaging and responsive environment where all children are empowered to make decisions about their own learning. Children will be supported to develop resilience and the skills to manage challenges, conflict and new situations with confidence. We will provide many and varied opportunities for all children to build capability and skills in all aspects of their physical, creative, cognitive, lingual, social and emotional development. We interact with our children to gauge their developmental progress, adjusting stimuli and related play accordingly. We acknowledge the value of each child’s journey through childhood as an opportunity to freely explore their world through play. We advocate for the development and implementation of laws and policies that promote the rights and best interests of children and families. Our goal is to grow happy, healthy, confident, inspired and curious children who demonstrate respect for diversity and social justice.